As you probably already know, the dark money groups behind the Mackinac Center have launched a full-scale attack on our union. Minutes after the Supreme Court issued their decision in Janus vs. AFSCME the Mackinac Center began emailing educators in Ohio and across the country encouraging them to drop their union membership. Who funds the Mackinac Center? That’s right—Betsy DeVos and her family. The Mackinac Center is dedicated to privatizing public education and expanding state and national voucher programs. They know your union stands in the way of their for-profit political agenda. And a big part of their strategy is to weaken your local association and OEA. 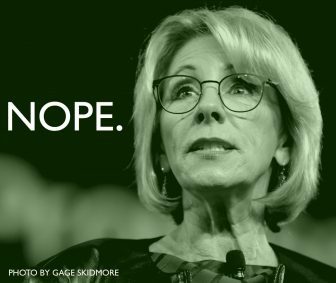 Betsy DeVos and the dark money groups who sent that email don’t have your best interests in mind. Every member needs to know – dropping their union membership hurts their union. Having a strong union means we can continue to fight back against unfair teacher evaluations, attacks on our pensions, and the expansion of low-paying charter schools. Protect your students. Protect your contract. Protect your profession. Let every member know that we will not fall for this scam from Betsy DeVos and her billionaire friends. Learn more about the ruling at: www.ohea.org/JanusDecision/.